The Edson and District Historical Society hosted Christopher White on October 10th for a tour and talk of the Old Edson Cemetery. Over 60 people attended the event despite the weather conditions. You can read Christopher's thesis here. Stay tuned for more historical events presented by the Edson and District Historical Society. The award winning horror movie, Below Zero, was filmed in Edson and was recently released on DVD. The Galloway Station Museum hosted Dee Hanna, a co-producer of the movie, along with Giles Merriot and Chris Pettie for a presentation of the movie. Audiences watched 25 minutes of the movie and then were intrigued by various movie props, production photos and set stories. The DVD is currently available for purchase at the gift shop. The Galloway Station Museum and Travel Centre was honored to recieve the Chamber of Commerce's Beautification award at this year's buisness awards. Congratulations to all the winners, their dedication and hard work makes Edson a better place for everyone. For the month of November, the Galloway Station Museum and Travel Centre will be displaying an exhibit dedicated to the sacrifices and achievements of Canada through her various war efforts. Starting with the Boer War and finishing in Afghanistan. The Canadian Military has been all around the world and has played major roles in battles that shaped the world as we know it. 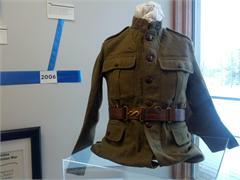 Artifacts donated by area residents will be on display, including a motor brigade uniform from 1914. A selection of wartime movies will be available to watch in our industry room inside the museum. Such battles as Vimy Ridge and D-Day are highlighted in the movies. The Galloway is hosting the temporary display 'Rainbow Mountains' from November to January. The display features 13 enlarged photographs from the first circuit of Mt. Robson and the country around Robson, Yellowhead Pass and Maligne Lake. The photographer, Byron Harmon took the pictures in 1911 during his expedition of the area. His photos give a very intimate look of the people and places in the Rainbow Mountain region. Values are a list of core beliefs that guide the ongoing work of the museum and interaction of all stakeholders including Edson and District Historical Society Board members, staff, and volunteers. The Edson and District Historical Society is committed to preserving and displaying its collection in an innovative, engaging and comprehensive manner while relaying the compelling history of Edson and area to local residents and visitors. The Edson and District Historical Society is committed to financial responsibility, continuous improvement of staff and board development while maintaining excellent customer service. The Edson and District Historical Society is committed to respecting and responding to the needs of the community, connecting and creating excitement with all ages and remaining open-minded to new ideas. The Edson and District Historical Society is committed to ongoing, quality research of its collection and regional history, enabling the creation of a comprehensive story of the Edson and area and to sharing that knowledge through exhibits, publications and educational programming. The Edson and District Historical Society is committed to the promotion of the Edson and surrounding area services, businesses and attractions through the Galloway Station Museum and Travel Centre and is dedicated to ensuring that staff is knowledgeable in both the history and amenities of the area. The Edson and District Historical Society is committed to providing individuals, community groups and businesses quality services and rental spaces to both create revenue and to promote the Galloway Station Museum and Travel Centre. The horror movie filmed in Edson is now on sale at the Galloway. Jayne Buchwald has made a wide selection of knitted scarves that are for sale at the gift shop. The Edson and District Historical Society has created a new mission statement for the organization. This new mission statement is a reflection of what the organization has now become and is hoping to achieve.